Indiana Governor Mike Pence (R) has extended a state of emergency as the state battles the worst HIV outbreak in its history. At least 135 people have been diagnosed in two counties and the epidemic is linked to needle-sharing by opiate users. The original public health emergency was declared on March 26, and would have expired on April 24. According to Indiana law, a state of disaster emergency may not continue for longer than 30 days unless the governor renews it. Pence extended the emergency via executive order on Monday. “While we’ve made progress in identifying and treating those affected by this heartbreaking epidemic, the public health emergency continues and so must our efforts to fight it,” he continued. As the epidemic has grown to 135 cases ‒ 129 confirmed and six preliminary positives ‒ it has also spread from Scott County into Jackson County. There are five cases in Jackson, according to health officials. The outbreak began in Scott County ‒ about 30 miles (48 kilometers) north of Louisville, Kentucky ‒ with the first diagnosis in mid-December. 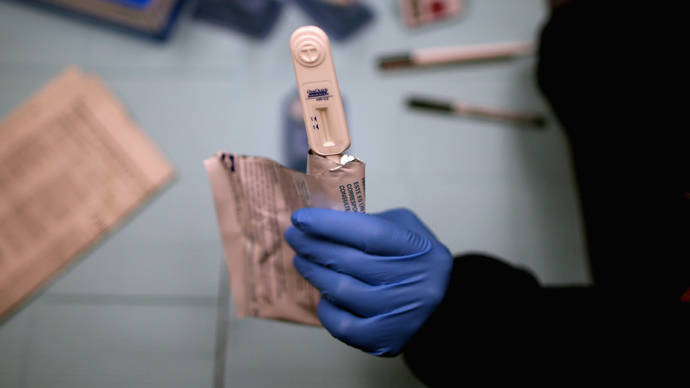 By late January, there were seven known HIV-positive patients in the rural, five-county area. In February, the number climbed to 26. When Pence initially declared a state of emergency at the end of March, there were 79 confirmed cases of HIV originating in the south eastern Indiana county. Typically, Scott County would see fewer than five new HIV cases in a year, state officials said. All of the cases are linked to intravenous drug abuse, mostly with the prescription painkiller Opana. The executive order allows the incident command center, created by the Indiana State Department of Health (ISDH) under the initial declaration, to continue coordinating HIV treatment and substance abuse treatment. It also continues to require state and local health, law enforcement and emergency response agencies, as well as health care providers and hospitals, to cooperate and assist in disaster response. 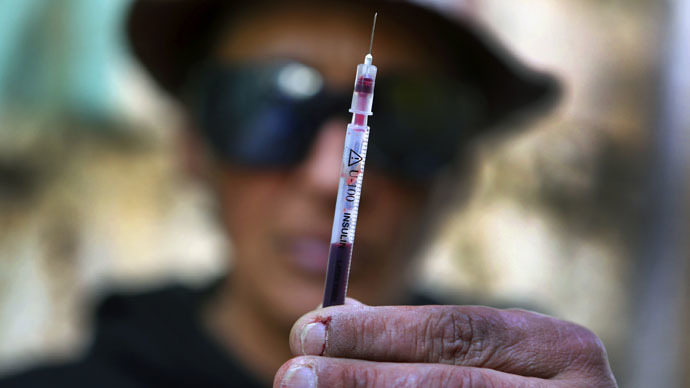 The state of emergency also extends the length of the “limited and focused short-term needle exchange program” in Scott County, but still doesn’t extend the program into neighboring counties, which critics contend is a massive failure on the part of the state. "[Interstate] 65 goes from south to north," Dr. Deepak Azad, an internist in Scott County, told the Indianapolis Star in March. "Keeping a needle exchange program only in Scott County is not going to solve the problem." Pence has consistently said he doesn’t support needle exchanges as an anti-drug policy, although public health officials and medical professionals say they are an effective way to combat the spread of diseases during IV drug use. Health officials told reporters Tuesday that 95 people have visited the community outreach center set up in Scott County under the initial executive order, bringing in 3,111 needles. The center has distributed 4,337 needles. It is illegal in Indiana to conduct a needle-exchange program, but the state legislature is considering lifting the ban. 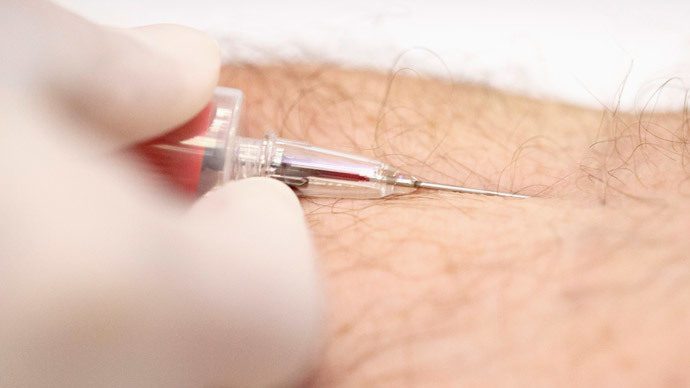 An Indiana Senate committee heard testimony Monday about a proposal to allow the counties at the highest risk of HIV outbreaks linked to intravenous drug use to set up needle exchange programs, according to the Indianapolis Star. Joey Fox, director of legislative affairs for the Indiana State Department of Health, signaled that the administration may be softening its stance on the programs. "This is a brand-new concept for the state of Indiana," Fox said during a hearing at a House-Senate negotiating committee on Monday. "I think the administration would be open to having a conversation." Despite the steps Indiana has taken under the state of emergency to prevent the further spread of HIV among intravenous drug users, according to expert testimony at the Senate committee hearing. An estimated 10 percent of the population of Austin, or about 430 people, are thought to use intravenous drugs, Dr. Shane Avery, a physician in Scottsburg, said. The HIV outbreak in the region could climb to about 200, or about half of all the IV drug users. “We have kind of a recipe for disaster, all the bad ingredients — unemployment, high dropout, high teen pregnancy rate, high drug abuse rate,” Dr. William Cooke, medical director for Family Foundations Medicine in Austin, told AP in March, noting that more than half of Scott County deaths are due to IV drug overdose. The administration will continue to monitor the HIV outbreak to determine whether a further extension is necessary.